I suspect that like a lot of you, my first trips to Tucson and Quartzsite for the shows was pretty much pedal-to-the-metal. Get there as quickly as I could to maximize the time I had at what still seems to me to be a self-serve, all-you-can-see-and-buy banquet of rocks and minerals that stretches on forever. This past year, however, my husband and I decided to add a few days to the journey and experience some different aspects of being a rockhound, and we had a blast. In this article, you’ll find some of the adventures we enjoyed while road tripping to Arizona for the shows. We live in the San Francisco Bay Area, and discovered early we could get to Blythe, California, just before Quartzsite in one long drive. You’ll find a lot more lodging choices in Blythe than in Quartzsite, and it’s only a few minutes to get from Blythe to the show. Tip: Buy gas in Arizona; it’s much cheaper. 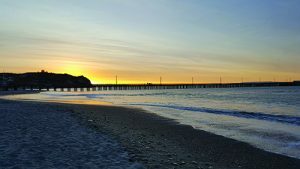 experience, some friends from one of my rock clubs mentioned Avila Beach. It was not only in Southern California, it has rocks and cliffs of rhyolite. Actually, the stone’s “official” name is DeeDeeite, named after the woman who saw it on the beach and discovered it was good for lapidary. 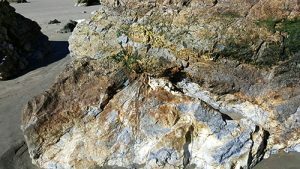 When you are on Avila Beach looking at the ocean, the DeeDeeite and cliff are on your left. The rhyolite comes in beige, brown, and a delightful blue. The most interesting material to me occurs when colors come together in a geometrical pattern. I didn’t see any signs restricting picking up the rocks, so I put some in my beach bag to bring home and work on. I didn’t take any tool to break off rocks, and you probably shouldn’t either. There are plenty of broken and/or water smoothed rocks on the ground. While there, I saw others collecting, but no one was using tools. Tip: Be sure to wear sturdy sneakers or shoes when you’re walking on the rock, as there is no sidewalk present. Plus, you’ll do best at low tide. 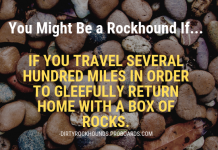 As you collect, you’ll want to restrict yourself to the very best smallish rocks. It’s a very long walk back to the parking lot or the lodgings, especially when you’re carrying rocks. Walking back toward the commercial area, you’ll see that the beach-front buildings are fairly new – less than two decades old. There’s a reason. For decades, Unocal had sent crude oil through pipes under the funky beach front businesses area. They leaked. For a very long time. It took decades to get things moving toward remediation, but once they did, 46 buildings and a mobile home park were demolished. In 1998, the contaminated sand was hauled away, and a beautiful new beach front with lodging and restaurants was built. It officially opened in February of 2000 with a celebration marked by the sound of blasting cannons on a tall ship as it sailed into the port. After several nights enjoying the beach and rockhounding in Avila, it was time to head East to Arizona. One way or another, I’ve managed to drive by the tiny town of Boron on Highway 58, near Highway 395, several times without going to the museum. Now was the time. It turns out that Boron has two museums. Both feature items representing the town and it’s mining history but from very different perspectives. A massive P&H shovel works to fill haul trucks in the pit. The shovel has an 85 ton capacity, making it capable of filling the 240 ton haul trucks in just three scoops. 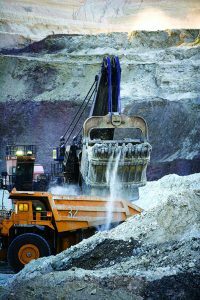 Due to their size, the shovels are utilized to remove the large quantities of overburden, while smaller loader equipment mines the actual borates. Colmanite: Colorless or whitish in daylight, colmanite is 4.5 on the Mohs hardness scale. 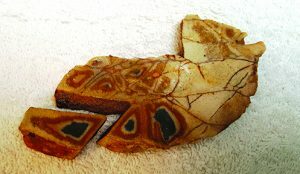 Some adventurous faceters have worked with colmanite crystals, but it’s too soft and not particularly attractive for use in jewelry. 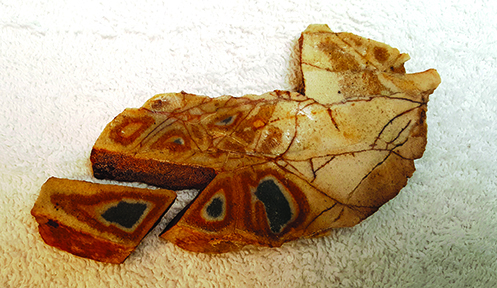 Ulexite: Very soft at 2.5 on the Mohs scale, the mineral ulexite is best known for two different style specimens. There’s the optical that is sometimes called “TV rock.” This is where the crystals have grown parallel to one another. Then there is the acicular “puff-ball” style, where incredibly fragile crystals fan out. Kernite: Crystals form in thin sheets, much like mica; but like ulexite, it’s only 2.5 on the Mohs scale. Once you get to the mine, you’ll drive a bit further into the site to reach the museum. As befits a museum to an active mining business, you’ll find a modern building and exhibits focusing on the science of borax and related mining practices. You’re sure to enjoy the professionally created displays and learn a lot about the corporate history of the mine, which was originally an underground mine and is now an open pit. My favorite moment of the tour was when the guide took us to a window that offered a breathtaking view of the operating mine. The scope of it brought to mind a man-made Grand Canyon. Weather permitting, this visitor center is open daily from 9 a.m. to 5 p.m., excluding major holidays. Admission is free, although donations are accepted to support local community organizations. As a souvenir of our visit, I was given a nice postcard that shows a picture of the mine, with four sample-sized specimens of the types of borax mined and interesting facts on the back side. There also is a huge, free parking lot that will accommodate recreational vehicles. 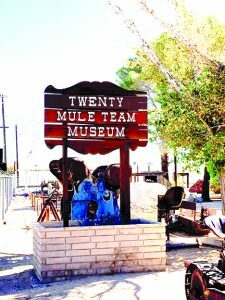 As with some other legends of the Old West, the lifetime of the 20 Mule Team wagons was relatively short. It was in operation from 1883 to 1889, at which time it was replaced by the Borate and Daggett Railroad. Each wagon team consisted of 18 mules and two horses hauling huge wagons loaded with 10 short tons (9 metric tons). The teams would transport the loads to the closest railroad spur in Mojave, which was 165 miles away. Within the museum is one of the original wagons. The museum is located in an old house originally used to house miners and their families. 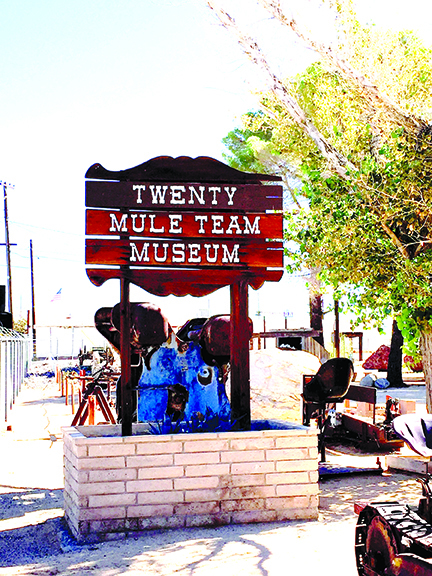 According to Jerry Gallegos, president of the museum, it was moved to its current site in the 1950s. 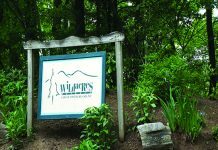 At that time, people who lived in the community and others who cared about the mine began donating items to the museum that were often used during the early mining years. For example, the original miners had no electricity or running water in their homes, and there are countless items from those old homes and small businesses on display. You’ll also find equipment used by miners that includes badges they needed to go underground and to charge their purchases at the store and gas station. 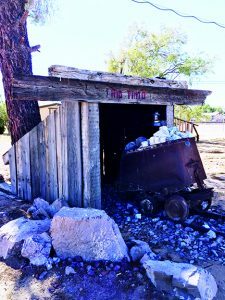 Gallegos, who worked in the mine for 38 years, is an entertaining source of information regarding the mine and the community of Boron. This museum is open from 10 a.m. to 4 p.m. every day, except Christmas. Entry to the museum and grounds is free. The museum does accept donations and sells souvenirs. There is also parking immediately in front of the museum. This is a full-sized replica of the opening used in the early years of mining at Boron. (Photo by Jerry Gallegos). show) and all the other fantastical venues to see something not directly rock-related, I went to two other shows and was really glad I took the time. 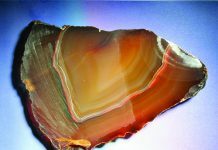 A great online resource for more information is www.jogsshow.com/tucson-gem-show-schedule or be sure to pick up a brochure once you arrive in town. Below are two free events I attended and recommend heartily. This event was held at the Quality Inn – Flamingo Ballroom located at 1300 N. Stone Ave. in Tucson, Arizona. In 2019 it will take place January 27 through February 10. 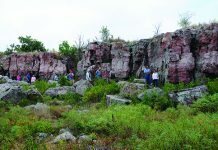 The event features live traditional music and a very nice variety of Native American arts and crafts with artists demonstrating beading and jewelry techniques. In addition, artists share the secrets behind authentic Native American pottery and rugs. It was the pottery that caught my attention first. One artist described how he finds the raw clay and crushes it into dust. Then he mixes the new clay with crushed shards of old pottery because the mixture helps keep the new piece water-tight. Local ingredients, such as spinach that had been drying for four months, are used to create the green color, while local earth provides the brown coloring seen in many pieces of pottery. This glass-blowing experience was presented by 4D Glassblowers, and, as its name suggests, is a brief, three-day event. The 2019 dates are January 31 through February 2. This smaller-scale show was fascinating. It was about one-third materials, including tools and glass rods. The rest was the artistic work of the vendors. Each vendor gladly described how they made their wares. I only regret that I wasn’t going to be able to get back for the “burn-off” contest and demonstration later that day because it sounded like a great event. 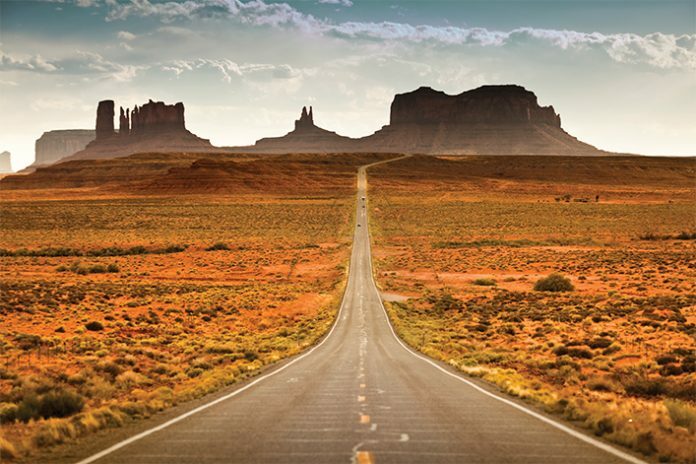 This account of our trip is just one way to find rock-related destinations to visit on your way to Quartzsite and Tucson for the annual shows. Start now and make a plan to make this the best show trip you’ve ever had. Maybe we’ll meet up along the way! A freelance writer and lapidary designer, Donna lives near San Francisco. She can be reached via her website: www.lapidarywhisperer.com. The welcome sign greets you in front of the museum, and you can see mining equipment around it. (Photo by Jerry Gallegos).